For most of the second half of the 20th century, North Carolina’s political leaders embraced the motto of the state toast and began to build an economic development agenda that reflected its fundamental values. Through investments in k-12 and higher education, the development of a nationally renowned community college system, and strategic sector-based economic development organizations and policy tools, North Carolina climbed steadily in the national rankings in terms of employment growth, per-capita income, and educational attainment. During the 1990s—a period of rapid population and job growth—the overall trajectory of household income growth mirrored the state motto. Incomes were rising throughout the income distribution: the weak were growing stronger while those who were already strong saw their incomes rise as well. 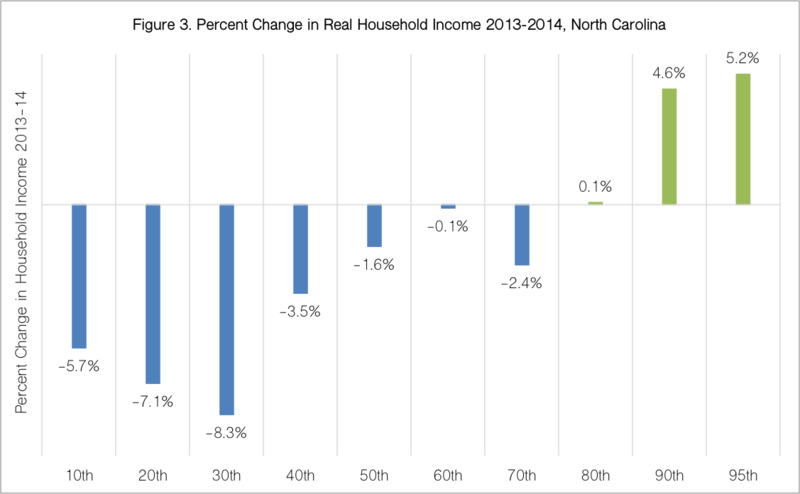 While higher-paid North Carolinians’ incomes grew faster, the overall pattern of economic development during this period could be called “shared prosperity” since residents throughout the income distribution made real gains. Underpinning this pattern was a strong set of state policies, including a progressive tax policy that encouraged growth with equity. North Carolina’s economic development strategy was also future-oriented: it made strategic investments in institutions, agencies and industries that not only helped support growth in emerging sectors of the economy, but helped the state transition its competitive advantage from low-wage, low-value added industries to develop strengths in advanced manufacturing, bio-technology, and finance. However, the current pattern of economic growth in North Carolina is markedly different. Income inequality is rising rapidly, yet unlike previous decades, the real incomes of the poor and middle class are also declining. The relatively weak job growth coming out of the Great Recession is concentrated in low-wage industries, while the traditional driving industries in North Carolina have not added jobs at a pace fast enough to sustain broad-based income gains. 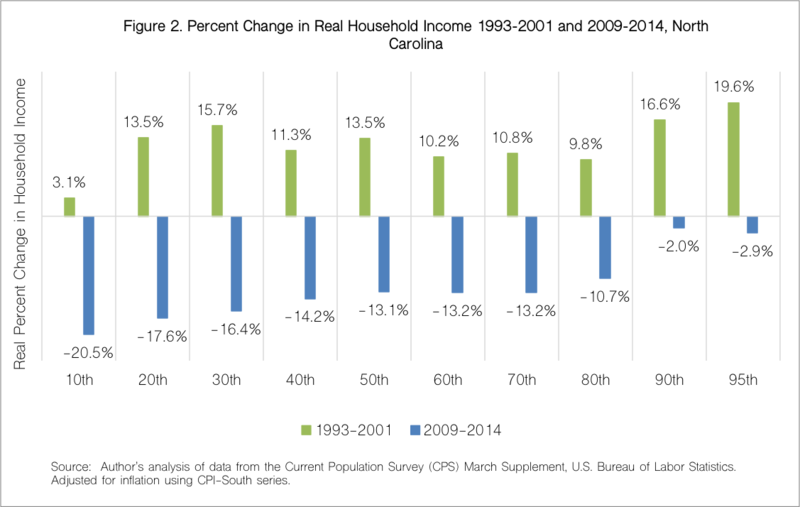 This stark contrast in the pattern of economic growth results in a bifurcation in the structure of opportunity for North Carolina’s citizens. For the first time in decades, workers in the bottom half of the income distribution are becoming worse off, even as those in the top five percent are wealthier than they’ve ever been. But just as the pattern of shared economic growth has reversed over the past five years, so too has North Carolina’s economic development policy. Many of the critical policies that helped plan for the future and balance economic growth have been threatened or completely reversed since the 2010 change in state leadership. Funding for higher education has declined,[a] as has funding for key sectoral and economic development initiatives. The Department of Commerce has been partially privatized, potentially undermining the State’s capacity to engage in long-term strategic targeting, and to analyze and vet recruitment deals fully. Political rancor over funding for incentive programs like the Jobs Development Investment Grant (JDIG) program has led to greater uncertainty, but more importantly, the debate over funding distracts from a needed conversation about stronger mediating institutions to improve how we award those incentives and ensure that they ultimately extend their benefits to a greater share of North Carolina taxpayers. A change in economic development strategy, in combination with regressive policy choices—such as the elimination of the state Earned Income Tax Credit (EITC), the failure to expand Medicare coverage under the Affordable Care Act and the end to local channels for promoting living wages—have profoundly negative impacts on equity. But equally, they threaten North Carolina’s chances for achieving long-term economic prosperity. The relatively weak job growth coming out of the Great Recession is concentrated in low-wage industries, while the traditional driving industries in North Carolina have not added jobs at a pace fast enough to sustain broad-based income gains. 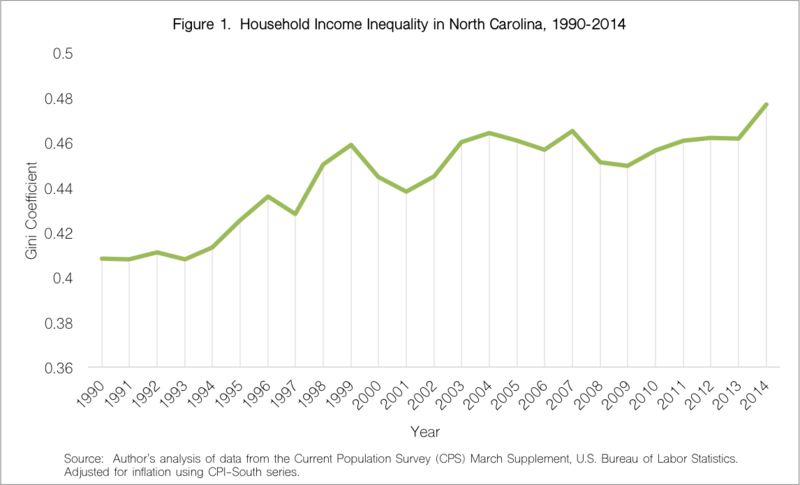 In this paper we document the structural changes in North Carolina’s economy by examining changes in the distribution of household income since the early 1990s. Next, we document the underlying trends in industrial restructuring between the period of relatively shared prosperity (1993-2001) and the current post-recession recovery period (2009-2014), noting the proliferation of jobs in low-wage industries. In section two, we provide examples of smart, strategic economic development planning that over the decades has helped to generate a model of inclusive economic growth. Through two examples, the Hosiery Technology Center and the NC Biotechnology Center, we document the critical role of state investments in both upgrading and retaining jobs in traditional industries (e.g. textiles and furniture) and attracting and growing an emerging high-technology manufacturing industry (biomanufacturing). In the final section, we offer recommendations for strengthening these and other tools and institutions that can help dampen unequal growth patterns and promote a return to shared prosperity. In the United States, wage and income inequality grew steadily since the late 1970s. Social scientists have offered a wide range of explanations for the growth of inequality including increased globalization, skill-biased technical change,  and the weakening of labor market institutions such as unions and the minimum wage in particular. In addition, research suggests that inequality rose sharply in the aftermath of the Great Recession, as the labor market recovery failed to create significant numbers of middle wage jobs. North Carolina has not been immune to this trend. In Figure 1, we present the trend in the Gini coefficient—a tool commonly used to measure inequality ranging from zero (perfect equality) to one (absolute inequality)—for household income between 1990 and 2014, using data from the March Supplement of the Current Population Survey (CPS). The Gini coefficient rose from 0.41 in 1990 to 0.47 in 2014, with the steepest increases occurring between 1993 and 1999--one of the strongest periods of national economic growth—and between 2012 and 2014, the current recovery period. Since the start of the current recovery in 2009, real incomes have fallen for all groups. What is concerning about the current period is that the largest changes were at the bottom of the distribution, with the bottom 10th percentile declining fastest at -20.5 percent, followed by the 20th at -17.6 percent. In fact, all groups below the 90th percentile experienced at least a 10 percent decline in real income during this period. The income of the richest groups fell slightly (2 to 3 percent) since 2009. If we look at the most recent year-over-year change however, we see an alarming pattern where the incomes of the bottom 70 percent of households continued to decline in real terms, while the top 10 percent have returned to positive growth. Overall, inequality rose during the 1990s due to real gains of the wealthy growing faster than the poor, whose incomes were also growing albeit at a slower pace. The 2000s was somewhat of a lost decade in that overall economic gains were weak, eroded by two recessions in 2001 and 2008, resulting in minor changes in the overall pattern of household income growth. But post-2008, income inequality has risen sharply as the income of the bottom 80 percent of households has declined in real terms. Nearly all the gains in real household income have accrued to earners at the top of the distribution, which results in a highly unbalanced growth pattern. To understand why the current pattern of economic development produces a structure of household opportunity that is markedly different from the 1990s, we examined the nature of employment change by industry in North Carolina. From 1993 to 2001, the state experienced a robust job growth rate of 25.7 percent, gaining over 770,000 jobs. As seen in Figure 4, which charts the top 20 industries in terms of net job gains, North Carolina’s economy added jobs at a range of wage levels. While service sectors led in terms of net job growth between 1993 and 2001, there were a range of wage levels including high-wage industries like Professional, Scientific and Technical Services ($5,507 per month), moderate wage sectors like Educational Services ($3,528), and low-wage sectors like Administrative and Support Services ($2,592) and Food Services ($1,472). 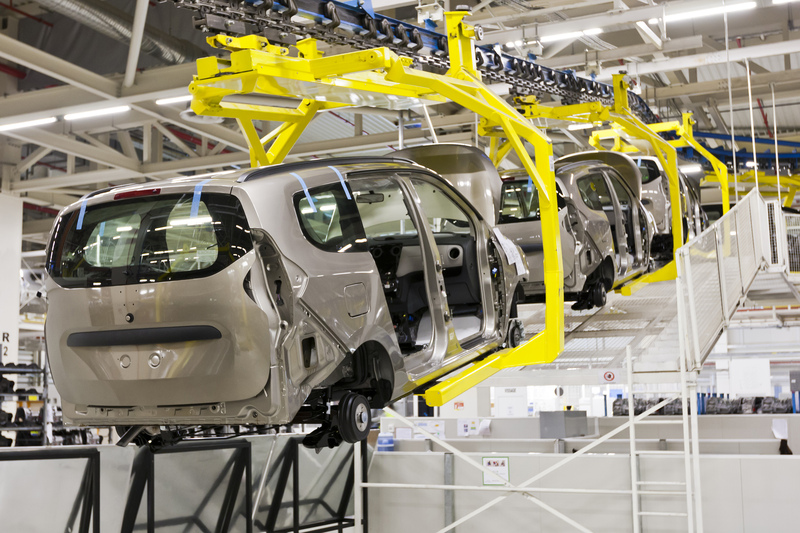 The 1990s was also a critical transformation period for manufacturing in North Carolina. While older sectors like textile mills and apparel manufacturing suffered significant job losses, there were significant increases in higher-wage manufacturing industries like Computer and Electronic Product Manufacturing ($9,264) and Fabricated Metals ($4,039). Overall, despite heavy declines in traditional manufacturing sectors, North Carolina gained 2,400 manufacturing jobs over this period. Furthermore, North Carolina moved up the value chain, by replacing lower wage jobs with jobs in more capital intensive, higher wage sectors. 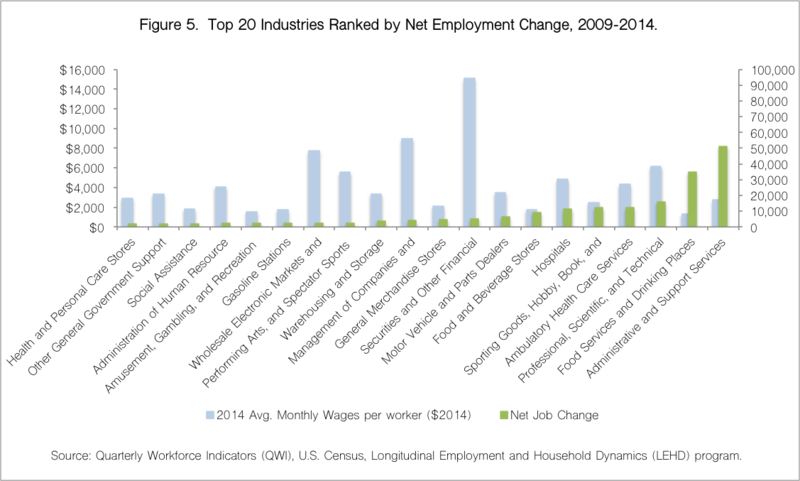 An examination of the top jobs-producing industries since 2009 indicates similar service sector led growth pattern (see Figure 5). However, the pattern of job growth is more bifurcated, as moderate-income services such as Education declined during this period. In addition, the two leading sectors that account for the majority of net employment gains—Administrative Services and Food Services—paid wages well below the state average of $4,058 per month. In addition, real wage growth was negative for the restaurant sector, declining from $1,472 to $1,340 per month in 2014 dollars from 2001 to 2014. 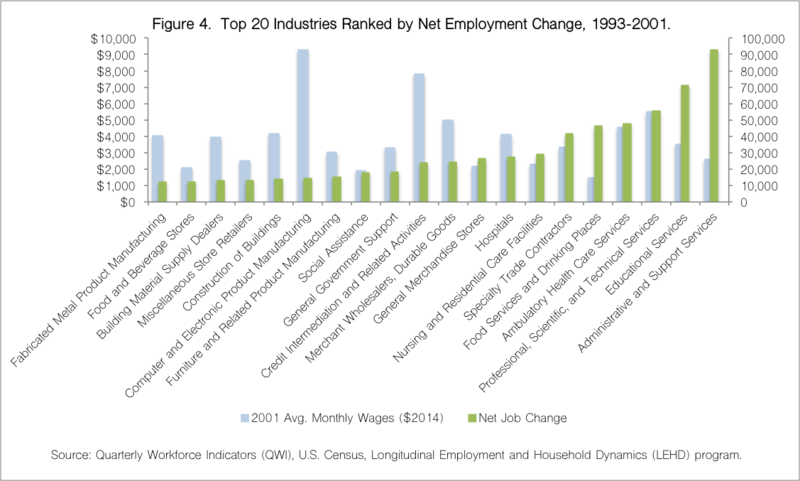 The growing manufacturing industries that helped balance the wage distribution during the 1990s declined significantly during the current recovery period, and no manufacturing sector appears in the top 20 by net job growth. Fabricated metals declined by 1,197 jobs and Computers and Electronic Equipment by another 8,852. Ultimately, while North Carolina’s recovery features a few bright spots in terms of growth in high-wage sectors such as Finance and Professional Services, jobs in low-wage industries like restaurants and temp agencies have dominated the pattern of industrial growth in the current period. In the following section we highlight two cases of how strategic interventions by state government helped reshape the pattern of economic growth in a way that led to income gains deeper in the income distribution. North Carolina, as with other states, has pushed forward each agenda through parallel policy channels and initiatives. The more interesting experiments, however, involve strategies that intentionally integrate growth with equity. At the state level, an especially promising approach has used an industry or sector-lens to bring a variety of economic development tools, practices and practitioners (and ultimately development concerns) together through a coordinated institutional network. This approach allows practitioners and support organizations to more intensively focus their collective expertise and effort on developing a specific industry or technology around which several related industries coalesce. In the process, they also have an opportunity to extend industry support in ways that promote inclusive forms of development to the benefit of traditionally underserved or disadvantaged North Carolinians. Over the past 40 years, North Carolina’s General Assembly has provided considerable support to a variety of industry-focused initiatives spanning traditional and emergent industries. One important traditional sector initiative is the Hosiery Technology Center (HTC), established in 1991 as a result of an industry-wide organizing effort to secure government assistance for technological upgrading. The Center was created through a legislative act based on the recommendations of the North Carolina Alliance for Competitive Technologies, a state-wide strategic planning initiative created by then-Governor Jim Hunt to coordinate support of manufacturing technology development. HTC initially focused on worker training as a means to help the incumbent hosiery workforce keep pace with technological change. In recent years, the HTC has been further scaled as part of the Manufacturing Solutions Center (MSC), which maintains its formal affiliation with Catawba Community College, and continues to receive partial funding support from the General Assembly via the state’s Industrial Extension Service. In addition to workforce training and research and development assistance to hosiery firms, MSC has recently added services in product testing, quality control and prototype development. Drawing on years of experience working in hosiery, MSC staff extend similar support to other areas of textiles and also to furniture manufacturing, yet another legacy industry for Western-Central North Carolina. As one example of its expanding industry reach, the MSC helped form a new ‘value chain’ initiative in 2013 called the Carolina Textile District, a consortium of 40 existing manufacturing and service firms that together offer full service product development support to a new generation of U.S. textile entrepreneurs, as well as to firms that are reshoring textile production in the United States. As a founding partner of the Carolina Textile District, the Manufacturing Solutions Center helps established textile manufacturers recognize the value of working with innovative designers and young entrepreneurs, and in the process, realize the long term growth potential from bidding for smaller-batch design and prototype work, knowing some of these contracts will eventually result in full-scale production demand. This is a considerable shift in orientation for many firms, but one that is helping to stabilize textile employment in North Carolina by positioning the state as a leading domestic manufacturer for new and innovative product lines, including the latest wearable technologies. The Manufacturing Solutions Center in partnership with Opportunity Threads, another co-founder of the Carolina Textile District, are committed to job quality and push District members to pay workers at or above a living wage rate. In this regard, the Manufacturing Solutions Center promotes quality standards not simply through the training and technical services they provide to firms in North Carolina, but through the manufacturing jobs they help to create and support. By promoting job quality (not just job quantity) they have developed a model for economic development that works in the interest of both business owners and their employees. The Manufacturing Solutions Center provides an example where government leadership and support can be a stabilizing and innovative force for maintaining competitive advantage in important legacy industries, like textiles and furniture. But long-term economic progress also requires concurrent strategies that nurture and anchor high-growth industries in the state. Fortunately, here too North Carolina has demonstrated considerable leadership and with established models from which to build. One clear example is in biopharmaceuticals. In 1981, at a time when North Carolina had only one biotechnology firm to speak of, our state legislature made a bold, forward-thinking move in creating the nation’s first state-funded economic development organization in biosciences. The founding of the North Carolina Biotech Center was itself part of a wider commitment by state leaders to strengthen and advance technological and scientific capabilities. In fact, the Biotech Center was proposed in the same report of the North Carolina Board of Science and Technology that lead to the creation of the Microelectronics Center of North Carolina and prestigious North Carolina School of Science and Mathematics. Early on, the Biotech Center positioned itself as an enabling institution, but always with a long-term goal of promoting industry and employment growth. Rather than duplicating university and corporate research expertise, the Center took early steps to strengthen programs and collaborations in applied and basic microbiology, including support for faculty recruitment, grants for university research and equipment acquisition. The Biotech Center has intentionally sought to extend its labor market reach by pulling down the bioscience career ladder to less educated North Carolinians, including those displaced from traditional manufacturing industries like textiles, furniture and tobacco processing. Over the decades, the Center has identified new targets for strategic planning. In the late 1980s, the Center initiated a multi-year review process that resulted in the nation’s first field experimentation ordinance for genetically modified organisms. By creating a clear, well-understood regulatory process, the Center helped reduce risk and uncertainty for companies and communities alike, thus making North Carolina a friendly place for investors and companies to support complex and at times, controversial experiments in agricultural biotechnology. Additionally, starting in the early 1990s the Center began actively nurturing entrepreneurial development, and since that time has provided over $20 million to early-stage and mid-stage firms in the form of low-interest loans. Repayment rates for this loan program remain strong. For each $1 loaned out by the Center, an additional $118 dollars has been secured from outside funding agencies and investors, both public and private. This speaks volumes to the Center’s due diligence and in-house risk-assessment capabilities. Through these activities, the Center has kept North Carolina on an upward employment trajectory, resulting in high-paying, rewarding careers for the state’s scientific talent pool, including alumni of North Carolina’s undergraduate and graduate institutions. But equally important, the Center has sought to extend its labor market reach by pulling down the bioscience career ladder to less educated North Carolinians, including those displaced from traditional manufacturing industries like textiles, furniture and tobacco processing. As part of that effort, the Center has added industry recruitment to its tool kit, focusing especially on recruiting large-sized pharmaceutical and medicine manufacturers to our state. Since 2001, the Center has taken a proactive stance with regard to recruitment activities, engaging national and international firms well in anticipation of their manufacturing needs and working closely with their executive teams to shape awareness of North Carolina’s bioscience strengths and assets. Behind the scenes, the Center’s staff has worked tirelessly to build out a flexible, adaptive system for supporting workforce development. In the process, they have helped create a vocational education and training system that is the envy of many other states and has resulted in many large-sized bioscience manufacturers relaxing requirements for a college degree in order to make room for job seekers with less formal academic experience, but with valuable and transferable manufacturing or military skills and expertise. Working closely with a network of North Carolina community colleges, the Biotech Center has helped individual colleges negotiate with biopharmaceutical firms to the benefit of displaced manufacturing workers. Our research shows this ‘mediated’ approach to bioscience recruitment produces significantly better employment outcomes and better returns for North Carolina tax-payers than scatter-shot approaches that lack industry-specific guidance and strategic planning support. Still, all is not rosy in biosciences. Subsequent years of budget cuts have curtailed key programs and most notably forced a dismantling of the Center’s in-house Education and Training Division. Existing partner organizations, including BTEC at NC State University and Bionetwork, have helped fill some of this void. But still, these organizations too are struggling in the face of on-going budget constraints. Additionally, with less government support, the Biotech Center has been unable to expand new programs targeting firms that neither fall within the category of early-stage biotechnology, nor fully mature pharmaceutical giants. In this “murky” middle are home-growth North Carolinian establishments that are on the cusp of take-off, but also on the radar of job-hungry recruiters from other competitor states. These are often firms that received initial support from the Biotech Center and other state-funded entities, so their relocation would be lost investment for our state. With less funding, the Center is forced to make difficult choices over which industry, economic and workforce challenges to prioritize and when—choices that could slow the pace of bioscience job growth, but equally affect who in our state continues to benefit from it. North Carolina faces some deep economic development challenges in the current era of imbalanced growth. The current pattern creates a plethora of low-wage jobs and relatively few high-paying jobs in a narrow set of service industries. What’s missing from the current labor market are middle wage jobs, particularly in sectors that employ workers who’ve been laid off from declining industries or who lack a college degree. In this section we offer three recommendations for state and local government action to accomplish two key goals: Goal #1: support the growth of industries that provide jobs in the “missing middle;” and Goal #2: provide support to low-wage workers and households to help ameliorate their declining relative incomes. Recommendation #1, the state should reinvigorate its current sectoral strategies, including increasing support for existing sector initiatives. Recommendation #2, the state should extend this proven method of long-term strategic intervention by promoting new statewide economic development planning efforts around several nascent industry clusters that are already proving competitive in North Carolina. Recommendation #3, state and local leaders should strengthen labor standards and income supporting policies such as the minimum wage and the EITC that are targeted towards low-wage workers. These actions will not completely reverse the trend towards rising income inequality. Nor will they fundamentally alter the role of government intervention into the market. Instead, they have the potential to reshape the overall structure of opportunity by ensuring that all North Carolinians participate in the new economy in a meaningful way. Sector strategies are often classified as industrial policy, through which state governments selectively pick and choose which industries to focus on and promote. But this is too narrow an interpretation, and overlooks the more inclusionary and flexible way that North Carolina has utilized a sector approach over the decades. In our state, a sector approach entails the creation of an institutional and networked platform for identifying barriers that can limit our ability to leverage existing strengths in technology, industry and education to promote economic growth and prosperity. Through this approach, state leaders have positioned North Carolina as a national leader for emergent industries and technologies, but also have identified high growth opportunities within legacy industries that might be facing overall employment decline. Examples of growth pockets supported by sector strategies include non-wovens in textiles; specialized segments of furniture, including design-oriented upholstered and wood furnishings; and medical devices. Related to this, the sectoral approach is often used as a consensus-building framework through which multiple stakeholders—from the private sector, academia and government—can work together to coordinate strategy and respond to emergent, often unanticipated economic challenges. The earlier mentioned example of North Carolina’s field experimentation ordinance provides an illustration. This approach to economic development has long been in play in our state. For example, the North Carolina Department of Commerce created loosely formed sector teams as early as the mid-1990s, drawing in a wide array of industry experts and institutional resources throughout the state to help guide business recruitment efforts in multiple industries, including life sciences, textiles and aerospace. Similarly, our state-mandated regional partnerships were tasked early on with mapping their regions’ existing and anticipated industrial-mix, thus helping the state identify opportunities for cross-regional resource alignment and strategy coordination. This approach itself grew out of initial recommendations by Commerce’s Policy Division (now called the Labor and Economic Analysis Division) and has been aided through time by that Division’s thoughtful and thorough approach to data and policy analysis. Looking forward, there are opportunities to reinvigorate the sector approach. At a foundational level, this can be achieved by increasing support for well-established sector agencies, including the Manufacturing Solutions Center and Biotechnology Center featured above. Also, the North Carolina Department of Commerce can reinforce its commitment to a sector strategy by informing the newly created Economic Development Partnership through evidence-based research on industry growth opportunities and gaps. The Hosiery Technology Center, Manufacturing Solutions Center and Biotech Center are just three examples where state leaders have demonstrated a willingness to cross the political aisle to support innovative strategies that help shore up legacy industries and also ensure North Carolina can take full advantage of emergent technologies. Other industries are well positioned for state leaders to step in with sector support, and already have the makings of a robust network of support organizations that can connect all major elements of economic development—workforce, entrepreneurial support and industry recruitment. Aerospace represents one prospect with the newly formed NCAero, a non-profit partnership of government, industry and academic representatives whose primary goal is to match the needs of business “with the capacity of our communities and related efforts in transportation and logistics.” [b] An especially noteworthy partner is the North Carolina Center for Global Logistics. With connections to at least four community colleges and a capacity to guide curriculum development, the Center for Global Logistics supports quality job opportunities that cross the traditional manufacturing-service industry divide. Another bright spot is clean technology, including the application of information technology to enable households and businesses in North Carolina to save money though more efficient energy-use management, often referred to as “smart grid.” Here, state leadership could further strengthen relationships between two emergent clean tech clusters—one coalescing around Charlotte, the other around Raleigh, and with an eye towards supporting both technology entrepreneurship and manufacturing job growth. But equally, state involvement could ensure the benefits of clean technology employment growth and entrepreneurial development extend out into our rural communities. Hog waste, for example, is a logical target for state leadership in support of clean-technology and with the goal of positioning North Carolina as a national leader in biogas alternative fuel—a desire shared by environmental technology firms and farmers alike. While the previous two recommendations involve a renewed effort on the part of the state to engage in long-term strategic economic development with a focus on sectoral strategies, local governments have a role in promoting shared prosperity. Counties and cities can align their own incentive policies, business attraction efforts, and workforce development initiatives to coordinate with higher-level state targets. Case studies illustrate how this is being done in both urban and rural counties. [c] However, county and local governments should be encouraged to integrate strong labor standards into their incentive policies by enforcing living wage requirements on any business that receives a local incentive—Durham is a proven leader in this effort. [d] Cities throughout the country are increasingly adopting such “business assistance” living wage provisions as a means to ensure public dollars do not flow to companies paying wages so low that workers remain below the poverty line and relying on public aid. Research has also shown the local jurisdictions that include living wage provisions in their economic development incentive policies do not suffer from lower employment growth rates or a declining business climate. Similarly, local governments should have the ability to require higher labor standards for companies that hold public contracts. However, the state legislature removed this authority by passing HB74, which outlaws living wage requirements and paid sick leave ordinances for local government vendors. Evidence we have collected from one of two local North Carolina counties that applied living wage standards to government contractors before HB74 suggests such laws do not cause major economic harm; and in fact, the vast majority of companies that increased their wages as a result of this requirement acknowledged they benefited from this wage increase through reduced worker turnover, recruitment of more highly skilled workers and higher overall productivity. Preventing local governments from using one of the few tools at their disposal to promote shared prosperity only reinforces the current imbalanced growth pattern. While North Carolina’s economy faces the challenge of growing inequality and imbalanced growth—trends that are present throughout the U.S. economy—the state can build on its long tradition of strategic policy intervention that helps reshape predominant growth trends to foster broad based economic prosperity. This was the approach that helped underpin the observed growth pattern of the 1990s and earlier decades in this state. We have gone through a particularly volatile economic period. Recessions in 2001 and 2008 ate away at personal income throughout the distribution and they have also affected public spending. But as the national economy recovers and government revenues increase, we need a more encompassing development strategy that parallels the state toast, ‘where the weak grow strong and the strong grow great’. Without a new strategy, the structure of opportunity will be fundamentally altered, producing a starkly different growth pattern that will have profound and negative implications for our future—a future in which 70 percent of North Carolina households will be at risk of being left behind. Solutions are in reach, including reinvesting in sectoral initiatives, targeting investments in emerging industries that have real competitive strengths in North Carolina, and maintaining a stronger wage floor. With these and related forward-thinking actions, our policy leaders in North Carolina can promote shared prosperity and build a stronger bridge to the future. T. William Lester is an Assistant professor of City and Regional Planning at the University of North Carolina, Chapel Hill. His research interests are broad within the field of urban and regional economic development, but generally focus on the role of social institutions and policy interventions in reducing income inequality and promoting balanced economic growth. Dr. Lester received a Ph.D. in City and Regional Planning from the University of California, Berkeley. Nichola Lowe conducts research on economic and workforce development and is Associate Professor of City and Regional Planning at the University of North Carolina at Chapel Hill. Her work focuses on the institutional arrangements that lead to more inclusive forms of state and local economic development and specifically, the role that development practitioners can play in aligning growth and equity goals. She joined the faculty at UNC-Chapel Hill in 2005 after receiving her Ph.D. in Economic Development and Planning from the Massachusetts Institute of Technology. First and foremost, “smarter” incentive use means using existing grant programs like the Job Development Incentive Grant (JDIG) and One NC programs in the context of a broader strategic economic development plan for the state as a whole, and for specific regions within the state. Second, “smarter” incentive use would target incentive dollars to be used in concert with other policy tools at the state’s disposal; specifically, federal workforce development and community development block grant (CDBG) funds in order to leverage all available resources to enhance the impact of each incentive grant. Lastly, “smarter” incentive use would restructure the overall incentive package to ensure that incentive dollars are used to pay for things that will benefit North Carolina residents even if the specific subsidized company moves away. The series of reforms listed below can be thought of as involving both carrots and sticks from the point of view of potential companies seeking to locate in North Carolina with incentives. On the one hand, we want to keep the performance requirements built into JDIG and extend the rigorous up-front cost-benefit analysis to all deals, and require direct contact with the company to ensure each deal passes the ‘but-for’ test. On the other hand, we recognize that for some large-scale, transformative projects North Carolina is being outspent by other states. The following bullet points highlight specific reforms that fit under the general principles of developing “Smarter Incentives” in North Carolina. 1) Consolidate all of the state’s incentive programs (JDIG, OneNC, Utility Fund, etc.) under the control of an empowered Department of Commerce to ensure strict enforcement of performance provision and up-front fiscal impact analysis. Why? All incentive grants must be evaluated for their full fiscal and economic impact in order to set incentive levels and to align with additional reforms described below. 2) Perform a rigorous cost-benefit analysis of any proposed incentive project that clearly specifies the projected total fiscal impact to both state and local coffers. Why? North Carolina should build upon the existing analytical strengths of the Commerce department and the modeling techniques they have all invested in (e.g. the Walden model). Why? Having all projects fully analyzed will allow the State to benchmark future deals against past projects and allow for on-going evaluation. 3) Cap direct cash subsidy payments (e.g. JDIG payroll deduction rebates) at 60% of the projected ten-year fiscal impact. Why? This way North Carolina businesses and residents (i.e. taxpayers) are ensured a return on their investment. 4) In addition to JDIG funds, other sources of revenue such as Golden LEAF Foundation grants, utility funds, federal dollars such as Workforce Investment Act (WIA) and Community Development Block Grant (CDBG) funds should be combined in a separate “in-kind” subsidy as part of the incentive deal. These should include any kind of customized training programs ranging from job readiness programs to advanced firm-specific skills; infrastructure provision such as road improvements, rail spurs, water and sewer extensions; or low-cost equipment loan agreements where the state would retain ownership in capital equipment upon deal cancelation; and land purchasing. Why? The idea is to be as flexible as possible in building a package of incentives that meets the specific needs of the company/industry. Why? To showcase the natural competitive advantages of North Carolina, namely our educated workforce, high quality community college system, and good infrastructure. 5) Allow “in-kind” incentives in the form of training, infrastructure, or equipment to count for twice as much cash in the final deal, allowing the total incentive package offered to reach 120% of the projected fiscal impact. Why? To allow economic developers to package an incentive deal which has a higher total value, which is more competitive with other states for large, transformative projects. Why? Ensure that large incentive deals include a large proportion of funded activities that have value that remains in NC. 6) Use incentives in conjunction with long range strategic planning that leverages existing state supported assets that have a proven track record of transformative economic development. Examples include the NC Biotech Center, the Nonwoven Textiles Institute as well as facilities and institutes affiliated with the University of North Carolina and Community College systems. 7) Require that all jobs created in subsidized projects pay a real living wage. Specifically, require that the state only count jobs that meet or exceed the local living wage standard (or pay above 200% of poverty level, or MIT living wage calculator) towards the refunded cash grants in JDIG. Note: This wouldn’t preclude a company from coming and paying lower-wages for some jobs, but they only get a subsidy on jobs that pay a higher standard. Such measures have legal precedent. 8) To even the playing field between urban and rural counties in the State, we should allow local governments in Tier I counties to waive the local match requirement for OneNC grants. 9) Relax use of Tax Increment Financing (TIF) districts in Tier I counties for certain, large-scale economic development projects and allow TIF district lines to include land surrounding the subsidized company’s site. [e] Minimum wage impact figures for North Carolina were derived from data from the Bureau of Labor Statistics (BLS) Current Population Survey (CPS), 2013 March Annual Supplement. See The State of Low Wage North Carolina report for more details. http://www.lowwagenc.org. [f] The State of Low Wage North Carolina, http://www.lowwagenc.org. Fall 2104. Feenstra, R. C. and G. H. Hanson (1996). "Globalization, Outsourcing, and Wage Inequality." NBER Working Paper Series WP 5424: 1-13. Bound, J. and G. Johnson (1992). "Changes in the Structure of Wages in the 1980s: An Evaluation of Alternative Explanations." American Economic Review 83 371-392. Katz, L. F. (1999). "Changes in the wage structure and earnings inequality." Handbook of labor economics 3: 1463-1555. Western, B. and J. Rosenfeld (2011). "Unions, norms, and the rise in US wage inequality." American Sociological Review 76(4): 513-537. Lee, D. S. (1999). "Wage inequality in the United States during the 1980s: Rising dispersion or falling minimum wage?" Quarterly Journal of Economics: 977-1023. Dube, A. (2013). Minimum Wages and the Distribution of Family Incomes. Amherst, MA, University of Massachusetts, Amherst: 68. Project, N. E. L. (2012). The Low-Wage Recovery and Growing Inequality. New York: 8. Fitzgerald, J. and N. Green-Leigh (2002). Economic Revitalization: Cases and Strategies for Cities and Suburbs. Thousand Oaks, Sage. Clark, J. and S. Christopherson (2009). "Integrating Investment and Equity A Critical Regionalist Agenda for a Progressive Regionalism." Journal of Planning Education and Research 28(3): 341-354. Feldman, M., T. Hadjimichael, T. Kemeny and L. Lanahan (2014). "The logic of economic development: a definition and model for investment." Environment and Planning C Government and Policy. Lowe, N., M. Tewari and T. W. Lester (2015). "Planning For Inclusive Prosperity: Lessons From The North Carolina Experience." Carolina Planning Journal 40: 1-10. Rosenfeld, S. (1999). Regional Technology and Innovative Strategies in the United Staes: Small Steps, High Expectations. Regional innovation strategies: the challenge for less favoured regions. K. Morgan and C. Nauwelaers, Psychology Press: 172-193. Rosenfeld, S. (1995). "Industrial Strength Strategies." Aspen Institute. Willis, R., R. Connelly and D. S. DeGraff (2003). The Future of Jobs in the Hosiery Industry. Low-Wage America: How Employers Are Reshaping Opportunity in the Workplace. E. Appelbaum, A. D. Bernhardt and R. J. Murnane: 407-445. Willis, R. (2005). Voices of Sourthern Mill Workers: Response to Border Crossers in American Factories and Jbs Crossing Borders. The American South in a global world. J. L. Peacock, H. L. Watson and C. R. Matthews, Univ of North Carolina Press: 138-151. Feldman, M. P. and N. J. Lowe (2011). "Restructuring for resilience." innovations 6(1): 129-146. Feldman, M. and N. Lowe (2015). "Triangulating regional economies: Realizing the promise of digital data." Research Policy. Lowe, N., H. Goldstein and M. Donegan (2010). "Patchwork intermediation: challenges and opportunities for regionally coordinated workforce development." Economic Development Quarterly: 0891242410383413. Lester, T. W., N. J. Lowe and A. Freyer (2014). "Mediating Incentive Use: A Time-Series Assessment of Economic Development Deals in North Carolina." Economic Development Quarterly: 0891242413514771. Lowe, N. and M. Feldman (2015). Breaking the Waves: Innovating at the Intersections of Local Economic Development Planning, University of North Carolina, Chapel Hill. Tewari, M. (2005). Non-local forces in the historical evolution and current transformation of North Carolina's Furniture Industry. The American South in a Global World. J. L. Peacock, H. L. Watson and C. R. Matthews. Chapel Hill, University of North Carolina Press: 113-132. Lester, T. W. and L. Brun (2015). "Quantifying the Value of Place-Based Exchange within A Global Production Network: The Case of High Point North Carolina's Furniture Market." Regions Magazine 297(1): 16-18. Lester, T. W. (2012). "Labor Standards and Local Economic Development— Do Living Wage Provisions Harm Economic Growth?" Journal of Planning Education and Research 32(3): 331-348. Dube, A., T. W. Lester and M. Reich (2010). "Minimum Wage Effects Across State Borders: Estimates Using Contiguous Counties." Review of Economics and Statistics 92(4): 945-964. Dube, A., T. W. Lester and M. Reich (forthcoming). "Minimum Wage Shocks, Employment Flows and Labor Market Frictions." Journal of Labor Economics. What makes a quality job in North Carolina?